While the ZFS file system does feature built-in data verification and integrity checking, since it’s not a clustered file system, ZFS pools can only be served by a single server head at a time. So, if the server fails, the ZFS storage and associated file and block services become inaccessible and there is no guarantee of maintaining availability. To help mitigate some of these challenges, this paper will introduce you to a stable, enterprise-class plug-in—RSF-1—which provides assured high availability for ZFS clusters, even in the event of a failure. 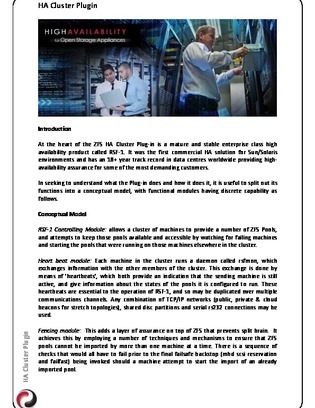 To see what the plug-in does, how to use it, and 7 functional models, continue reading below.